If you want to stay warm this Winter. One word. Chilli. Not to be confused with Chilly. Because my Quick and Easy Chilli Recipe is definitely not that. But, first things first. This is not-blow your head off, you may lose your mouth, eat at your own risk-chilli. No way. This is the kind of chilli that is family friendly comfort food, at its best. Think a rich meaty sauce with kidney beans, plenty of veg for nutrition and corn chips to scoop it all up. Because who needs a fork, when you can have a corn chip, right? The other awesome thing about this recipe. Quick and easy. 20 minutes. One Pan. Minimal effort. And you get to eat corn chips for dinner – did I already mention that? I’m pretty sure this recipe would also taste awesome with grated cheese stirred through it. You should definitely try it and report back. But, with or without cheese, I know you guys are going to LOVE this quick and easy weeknight warmer. 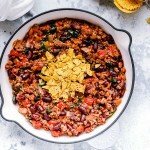 Think, a rich meaty sauce with kidney beans, plenty of veg and corn chips to scoop it all up. 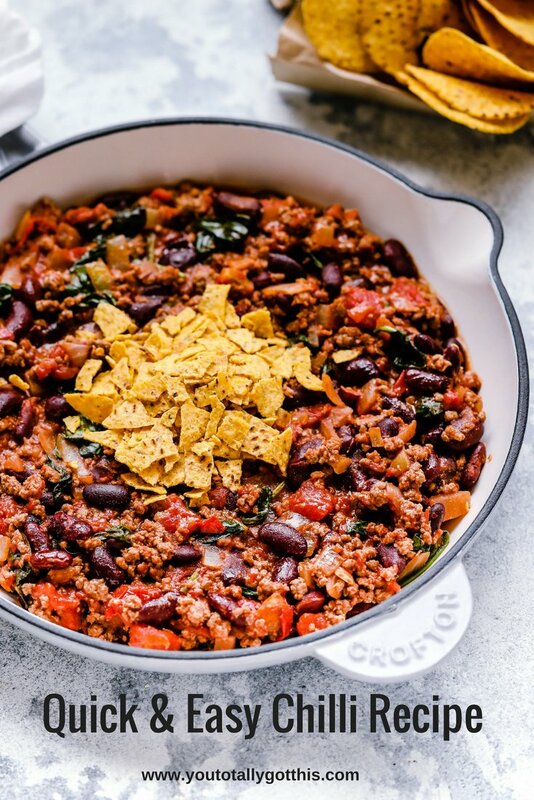 This 20 minute easy chilli recipe is family friendly comfort food, AT ITS BEST! Stir through the chilli, cumin, oregano and canned tomatoes. Bring the mixture to boil and then reduce heat to simmer for 10 minutes. It probably won’t need it, but If the mixture looks a bit dry, just add ½ cup of water. Meal preppers rejoice. My Quick Weeknight Chilli Recipe freezes like a dream. Not a fan of spinach? Add in any other veggies you like. Grated carrots and zucchini work well too. 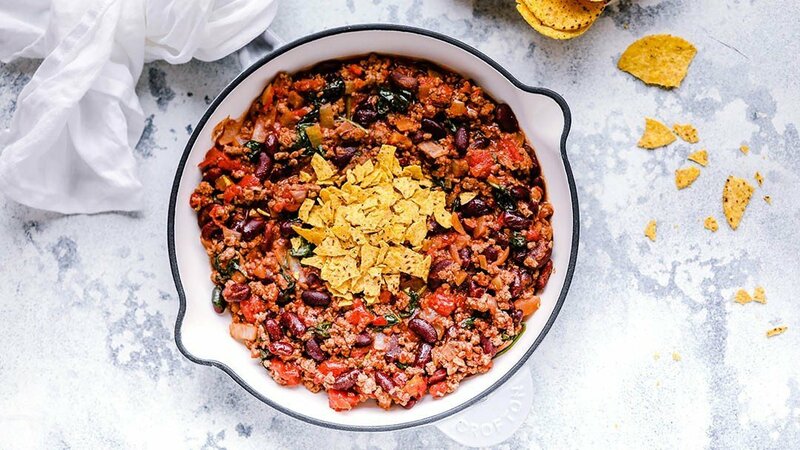 Making a family sized version of my quick and easy chilli recipe is easy – just double the ingredients. 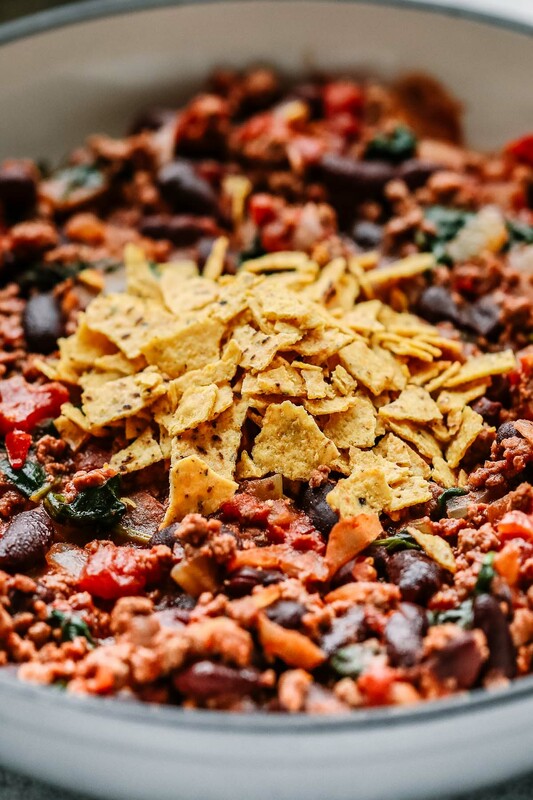 P.S – Want a whole weeks worth of dinners just like this awesome Quick and Easy Chilli Recipe? Grab your FREE quick and easy weeknight dinner plan right here. Just made this,, love it…. Yay…so glad you liked it. Thanks so much for stopping by to let me know.